Shortly after Starwood announced the addition of Design Hotels to its program, TPG Points & Miles Editor Sarah Silbert enjoyed a brief stay at one of the properties just added to the SPG chain: the Gramercy Park Hotel in New York. It’s been a busy month for Starwood, what with the news that Marriott will be acquiring the brand. Unsurprisingly, many current Starwood Preferred Guest elites may be wondering what the upcoming merger will mean for their benefits through the loyalty program, and while we likely won’t have many answers for some time to come, for now the SPG program continues to operate as usual. The hotel’s Jade Bar, attached to the larger Rose Bar. What’s more, Starwood recently added the Design Hotels brand to its property portfolio, allowing SPG members to enjoy select benefits — such as award-night redemptions and the ability to earn Startpoints for stays — at boutique-style, design-focused properties around the world. While all 287 Design Hotels have yet to be integrated into SPG, a handful of them are already bookable through Starwood. The first US property to join is the Gramercy Park Hotel, a ritzy property with an old-timey, artsy feel. Happy for an opportunity to experience a less cookie-cutter stay, my boyfriend and I made the Uber trip to the GPH for a mini-vacation in our own city. To enjoy a variety of Starwood Preferred Guest benefits at a Design Hotels property, members must book directly through SPG. In addition to earning 2 Starpoints per dollar on paid stays (or more, depending on your status), you’ll get night and stay credit toward SPG elite status and complimentary internet access and bottled water in the room. SPG Gold and Platinum members also get a Starpoints bonus as a welcome gift, and at select properties you’ll earn 2 Starpoints per dollar when paying with the Starwood Preferred Guest® Credit Card from American Express or Starwood Preferred Guest® Business Credit Card from American Express. We booked the cheapest date we could find, which happened to be on a Saturday night. Still, at nearly $400 before taxes, it was hardly a bargain. Rates on other nights were $749 and up (! ), so we felt pretty good about $399. Note that the rate matched what was available directly through the property, and was even a bit lower than on third-party booking sites. It actually dropped to $375 the evening before check-in, but Starwood was unable to adjust the rate since the free cancelation period had passed. SPG earnings from the one-night stay. 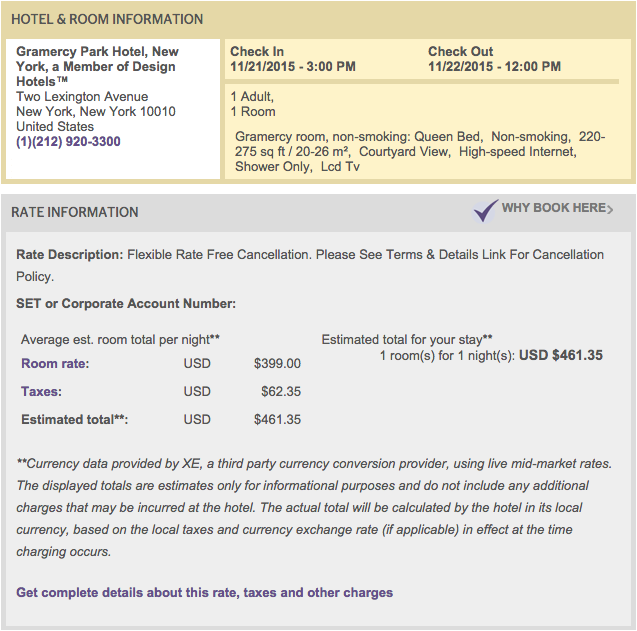 As 75-night SPG Platinum members, we earned 2,476 Starpoints for the one-night stay, before factoring in the additional two points per dollar for charging the room to an SPG Amex card. We also earned 18 base Starpoints for the $18 Uber ride, plus 54 bonus points for taking an Uber during a stay. The points posted the next day, just as they would with any other Starwood stay. Based on TPG’s valuation of 2.5 cents per Starpoint, the total haul (excluding Uber and the Amex bonus) is worth $61.90, which is a decent return. We waltzed into the Gramercy Park Hotel’s classy lobby around 6:30 on a Saturday night, and while there was no wait at check-in, the lobby itself was buzzing with a mix of guests and patrons of the Rose Bar and Maialino restaurant. Even the elevators get the design-hotel treatment. The friendly man who checked us in informed us that we were upgraded from a Gramercy Queen (the entry-level room category) to a Lexington King, though it’s important to note that SPG elites aren’t entitled to any upgrade at all. He also didn’t acknowledge that we booked through Starwood or the affiliation until we asked, but that’s not a big deal. Within five minutes, we were in the elevator heading to our room on the 10th floor. While not huge, the Lexington King Room is very tastefully decorated — like you’re stepping into the studio apartment of your intellectual artist aunt who ran away to New York — and roomier than some apartments in the city. I especially liked the funky embroidered chairs and the light fixtures, including a lamp extended over the dining table on a long beam, and the bedside lamps that can be adjusted with old-fashioned-looking hinges. The comfortable King bed also boasts a pretty cool design, with a wooden chest-style surface at the foot of the mattress for keeping odds and ends nearby. The modestly sized bathroom features a shower/tub and beautiful wooden panels along the walls. The design-conscious theme continues here as well, with a marble sink and hanging bulb lamps. The Gramercy Park Hotel offers guests Aesop amenities — the same line you’ll find at other high-end properties like the Park Hyatt Tokyo. They’re definitely some of the best among the many toiletries I’ve come across in hotels. Compared to rooms at other Starwood properties, especially those in the Sheraton and Westin brand, this one felt quite dark. The windows were on the small side, and the green walls and dimmish lighting didn’t do much to counteract this. I personally didn’t mind, but if you need your sunlight you’ll want to keep the curtains open and all the blinds raised during the day. We also decided to crack the window at night, since the HVAC made an annoying rattling sound until we switched it off. While the Gramercy Park Hotel boasts an onsite Italian restaurant from famed restauranteur Danny Meyer along with the Rose Bar and Jade Bar — both of which offer an intriguing list of very pricy cocktails — in true lazy weekend style we opted for room service. All of the hotel’s food and beverage establishments were actually fully booked on this Saturday night, though the concierge said she could get us into the bar if we really wanted to go. Both our room service entrees — fettuccine with fresh tomato, spinach and parmesan, plus a club sandwich with grilled chicken — were quite tasty. We also ordered a side of cajun french fries, though for some reason that last request didn’t make its way to the kitchen. The delivery person phoned in the order, though, and we weren’t charged for the fries when they arrived a few minutes later. Everything on the menu was on the expensive side, even for New York — $27 is a lot for pasta, right? Still, we were happy with our meal and enjoyed some $10 beers from the mini-bar. Hotel guests can access exclusive Gramercy Park. The hotel also offers a 24/7 gym, which we didn’t get a chance to check out. Perhaps the most unique perk of being a GPH guest, though, is access to Gramercy Park itself. This is notable because only residents of apartments on the park have the necessary key to enter, so if you want something of an exclusive experience you can ask a doorman to unlock the gate for you. This earns the hotel points for exclusivity, but as my boyfriend can attest, the park itself isn’t particularly remarkable. Plus, when you want to leave you have to call the hotel to have someone come and unlock the gate. It’s probably worth doing once, though, since only the few and the privileged can boast an eligible address to gain access. It doesn’t get more “upscale New York” than this. The hotel also offers other amenities, such as bicycles that you can borrow (for free) for two hours at a time. If you opt to grab a bike, just be very careful — GPH is located in a busy area of Manhattan, so don’t expect to have a leisurely ride unless you’re checking out the town early on a Sunday morning. With a luxe location right next to the city’s sole “members only” park and beautiful decor throughout the rooms and common areas, the Gramercy Park Hotel has much more character than the average New York City property. I’d recommend it to anyone looking for a unique stay, though the limited selection of SPG benefits — not to mention the fact that you can’t yet redeem Starpoints at Design Hotels — means it’s not for everybody. Overall, I enjoyed our brief stay, though I regret not ordering a drink or heading down to the beautifully designed Rose and Jade Bars. At least it’s easy to hop on the subway and make a return visit!